On 2nd April West Coast Railways, the UK's largest charter train operator had its license to run trains on the national rail network suspended by Network Rail. The notice issued by NR can be read here- It has essentially been deemed that safety is not high enough on the agenda of WCR following several incidents culminating in what NR describes as 'the most serious SPAD [Signal Passed At Danger] that has taken place this year' when a steam charter with 34067 'Tangmere' overshot a signal at danger at Wooton Basset Junction. The incident in question could have had dramatic consequences bringing the train directly into the path of a high speed passenger service- it doesn't bear thinking about. 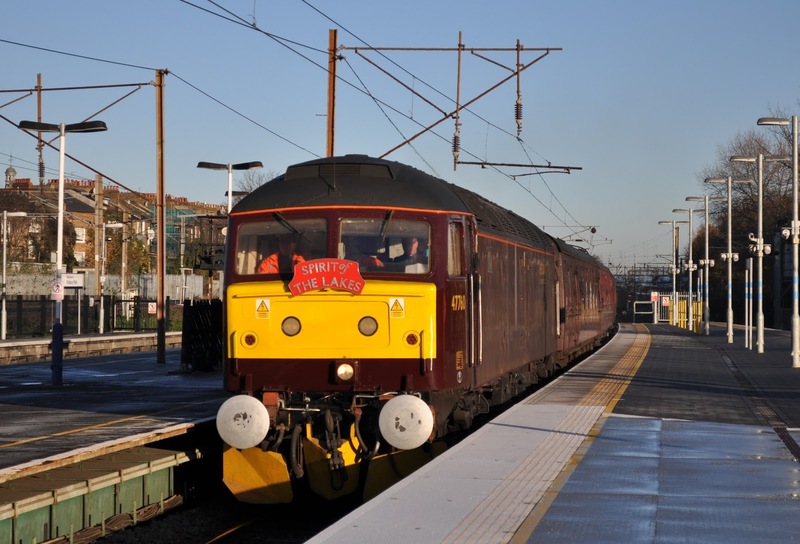 WCR's 47760 passes through Finsbury Park with a charter to the south coast in December 2014. Of course there was no collision and nobody was injured in this incident but the fact that there was even the potential for an accident of this magnitude has to be drawn into question. 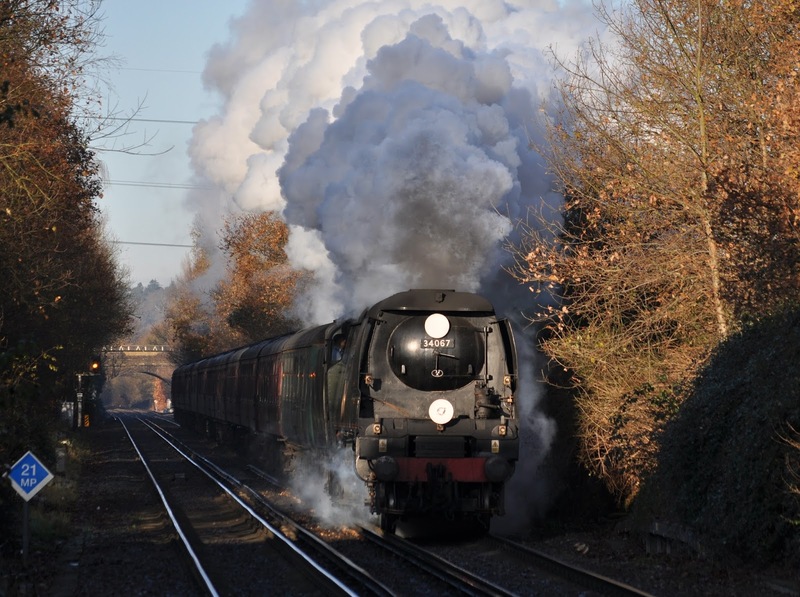 Wooton Bassett is seen on a WCR charter in December 2014. The fact that the UK has one of the safest railways in the wold is no accident. In fact it is of course due to accidents that the railway today is so safe. I would highly recommend anyone who has not read it acquires a copy of 'Red for Danger: The Classic History of British Railway Disasters [L. T. C. Rolt, 1955]' for a fascinating read of how the UK's railways have learnt from the accidents of the past to become the efficient and safe system they are today. The industry can proudly claim that it has not lost a life in an accident since the Greyrigg disaster of 2007 in which one elderly passenger sadly died. In recent years heavy investment has gone into safety- it is no surprise that since the introduction of Train Protection Warning System that the number of SPAD's has dramatically reduced. This system is designed to prevent incidents just like the one WCR was involved in at Wooton Basset. Sensors in the track are able to detect the speed of a passing train and on-board systems will automatically apply the brakes and bring it to a stand if it is exceeding the permitted limit. The TPWS sensors are located adjacent to key signals protecting junctions, at locations where there are speed restrictions and entering terminal stations where trains must stop. How therefore did the WCR train cause a SPAD of such a serious nature? 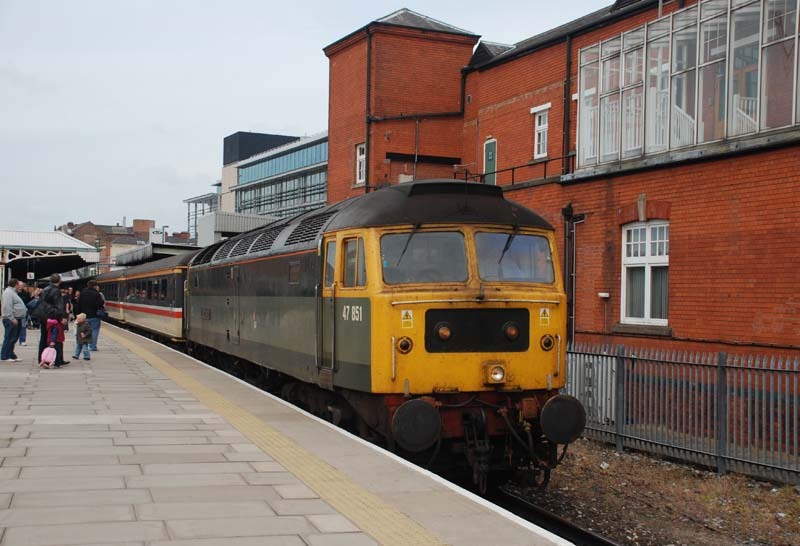 at Nottingham in 2008 with a train for Skegness. While the full report is not yet concluded, early indications suggest that appears in the WCR incident an action between the driver and fireman had isolated the TPWS and/or AWS (Automatic Warning System) rendering it useless. The train would no longer receive indications or brake applications from the track about it's speed or any signals it passed at danger. In normal operation critical safety systems such as these cannot be ignored. However there are situations when the TPWS and AWS can be overridden. Usually this would be as an emergency measure to move a train- any such a move would be agreed by the signaller under very strict conditions and the train would be removed from service. All systems can fail and railway systems are designed to 'fail safe'- a TPWS fault could cause a trains brakes to apply and not release. It is situations like this where on a busy railway authorisation could be granted to isolate the TPWS in order to clear the line. As far as it can be ascertained, no such instruction was received by the WCR crew. It appears they took the decision themselves to isolate the safety systems, continuing on their way without the signaller even being made aware of the situation. A grave decision which could, potentially have cost lives. The full report will make interesting reading. I have no doubt that in such a serious lapse of safety standards as this, and given NR has had 'concerns about WCR’s performance of its Safety Obligations for some time' the right decision has been made to suspend WCR's operations. Is this the end for WCR? I suspect, and hope not- after all WCR has a strong and profitable business. NR's suspension letter details the process for reconciliation- a list of seven steps WCR is required to take in order to re-gain it's operating licence. There will need to be some step changes to achieve this but it is clear that if WCR want to change their operations to comply with NR's requests then a solution could be reached. at the Eastleigh Works 100 open day in 2009. 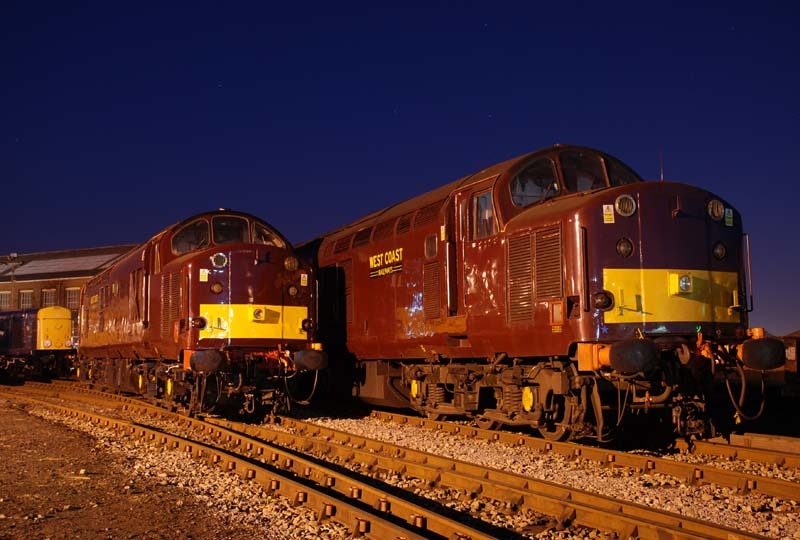 WCR has a significant business running charter trains with both steam locomotives as well as with it's heritage fleet of diesels. Being such a dominant operator in the charter sector means this suspension notice will certainly have consequence on that market. First and foremost a significant number of trains will be cancelled, and leisure travelers inconvenienced as a direct result of the inability of WCR to run its trains. We can also expect further work to be lost by WCR with it's reputation taking a huge hit. Other operators who contract their trains to WCR will surely think twice now that the company has a significant stain on it's safety record. The travelling public too might think about whether it wants to travel with a company shamed for its lapse safety standards. Staff will be affected too with work not forthcoming from WCR- many of their staff being on 'zero-hour' contracts such is the nature of charter work. Owners of steam locomotives also will see their hire charges disappear as their booked work is cancelled while trains are not running. Unfortunately there is likely to be no alternative operator waiting in the wings to take on this charter work. It is often regarded as 'marginal' in the rail industry, and although profitable the larger rail companies will need to put their core businesses first. Even if another operator such as GBRf or DRS were to take on some of this work it would be a long process to get the staff and systems in place to operate such a large schedule of trains- besides neither operators currently have a safety case to operate steam traction. Only DB Schenker is now able to run steam trains on the network and their resources for further charter work are severely limited. The suspension of WCR's operating license is a significant event. Never before on the UK's railways has a company had it's nationwide ability to run trains revoked. NR does not take a decision such as this lightly and there are clearly real concerns about how WCR has gone about its business. The UK runs a very busy, and very safe railway, and WCR must fit within this. It is very clear that no company will get away with a policy of 'playing trains' and running by it's own rules. I hope WCR resolve NR's concerns and quickly. They are a valuable part of the railway tapestry in the UK and the heritage sector contributes to many peoples enjoyment of the railways- it however cannot do so at any cost, without accountability and without due attention to safety. Cumbrian coast line. WCR's operations include the 'Jacobite' tourist trains in Scotland, they also ran the 'Hogwarts Express'. Well done NR. This "Government" hate Health & Safety and this has clearly rubbed off on WCR. If WCR were a doctor they would be struck-off.